I don’t get many media releases sent to me, but the ones I do, I’m selective about putting up. This one, sent to me from the folks behind the amazing Hoo Ha Bar in South Bank, is the kind of stuff I have no problems with putting up right away. Their new location in New Farm sounds pretty sweet! Check out the competition as well for a chance to win a double pass to their exclusive opening night! From the owners of Hoo Ha Bar, comes a new eating, drinking and general good times venue on Brunswick St, New Farm. 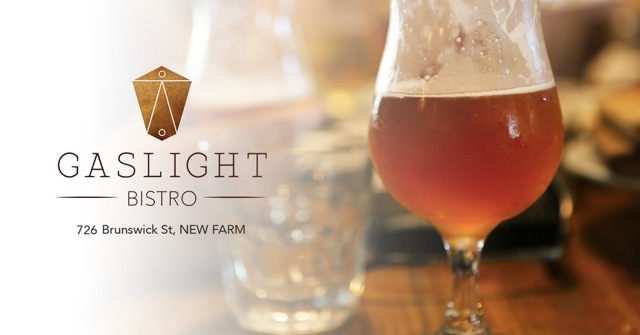 Gaslight Bistro is fitted with the same welcoming service and delicious food and drink as theircomfortable Southbank destination, but with new flavours and a relaxed and smart New Farm feel. Head Chef Travis Cameron is excited to be presenting a menu of charming delicacies, with a focus on quality, seasonal ingredients. The casual yet precise menu won’t fit into a particular genre of food, but will be seasonally driven, with flavour being first priority. On the winter menu you’ll find an array of well crafted and hearty breakfasts, including slow cooked ham hock and beef shank, or for a lighter start to the day roasted oat porridge. There are several delicious sharing plates for after work drinks; wagyu pastrami and pickles, crushed kipflers with aioli, or for comfortable finer dining, find Confit Duck, Braised Octopus and house cured Salmon. Gaslight’s curated beverage list includes local craft beer favourites Green Beacon and Brewtal Brewers, a selection of Australian and New Zealand wines and some irresistible cocktails. 726 Brunswick St has offered up a classic Queenslander for renovating, and the boys have done a beautiful job of transforming the space. It is an open, light, comfortable and stylish place to hang out. Offering weekend coffees and breakfast, lunchtime fare and evening drinks or dinner, this is a place you should be visiting several times over the week.